017 Maisons de Ville, Palais de Justice, &c.
018 Palestres, Colleges, Bibliotheques, Portiques, Bourses, &c.
028 Casernes, Arsénaux, Prisons, &c.
J. N. L. Durand, Recueil et parallèle des édifices de tout genre, anciens et modernes (1800), frontispiece. 047 Maisons Persanes, Chinoises, Turques, Moresques, Gothiques, &c.
It is very important for architects, engineers, both civil and military, painters of both historical and landscape scenes, sculptors, draftsmen, theatrical decorators, in a word, for all those who build or depict buildings and monuments, to study and know all the most interesting things that have been done in architecture in every country throughout the ages. But those buildings that deserve to be studied are mixed in with a flock of others that are not in the least remarkable; in addition they are scattered through nearly 300 volumes, for the most part in folios, whose purchase would mount up an enormous sum; and it is impossible for an artist to come to know them well except through the services of a library. Even this demands a great deal of time and it is not practical except for artists living in large cities. In addition, even if they were able to use this method, it is possible that the advantages it would give them would hardly repay their labors. Here is the reason: Often a volume is composed only of buildings of different types while those which are of the same type are scattered through a great number of volumes. You can see, this being the case, how long, difficult, imperfect and unfruitful the comparisons would be which are alone capable of forming judgment and reason. The difference of scale adds still more to this inconvenience. In this state of things, I felt that if the only objects that it is essential to be familiar with were culled from the 300 volumes I have just spoken of and if I reassembled them in just one volume whose price would not be higher than that of an ordinary work on architecture; this would offer artists a general and inexpensive panorama of architecture, a tableau that they could go through in a short time, examine without difficulty, study with fruitfulness; and above all, if I classified the edifices and monuments according to their kind; if I arranged them in order of their degree of likeness; if in addition I drew them to the same scale: This is what I have attempted to do. To arrive at my goal more certainly, I have excluded from this collection not only all objects that offer no interests of themselves but also those that resembled more or less closely other pieces of major interest, that would have only swelled the volume without increasing the sum of ideas. Perhaps some buildings will be found in this collection that will seem to be of little interest; but because they are almost the only ones of their kind in existence, I have thought it necessary to include them in order to draw attention to this type of architecture. Restorations whose authenticity is doubtful will also be found here, such as those of the thermae by Palladio and several buildings of ancient Rome by Piranesi, Pirro Ligorio, and others, but I did not wish to deny architects the handsome effect that these restorations give, and which they might frequently and happily apply. I have even permitted myself, not only to simplify them, but also to add some which are almost entirely of my invention; I hope that I may be pardoned for having dared to put myself beside these great masters; if only you will notice that far from having wished to correct them I have tried to show in a clearer way, the spirit which reigns in their magnificent productions. It is a well known fact Durand's textbooks were used all over Europe through many decades. Emil Kaufmann, Architecture in the Age of Reason (1966), p. 117. At last, mention may be made of Durand's renowned Recueil et parallèle des édifices de tout genre, anciens et modernes, typical of that interest in the past which was to last through the entire nineteenth century. Emil Kaufmann, Architecture in the Age of Reason (1966), p. 214. J.-N.-L. Durand (1760-1834) had studied architecture with Boullée before he served as an engineer in Napoleon's army. On the establishment of the Ecole Polytechnique by Napoleon in 1795, Durand was named a professor of architecture and in this capacity exercised great influence in the formation of the romantic classical style. His ideas of Structural rationalism and his concern for construction, materials, and methods were combined with a synthesis of the trends in theory and practice then present in France. These ideas were put forth in his course of lectures. 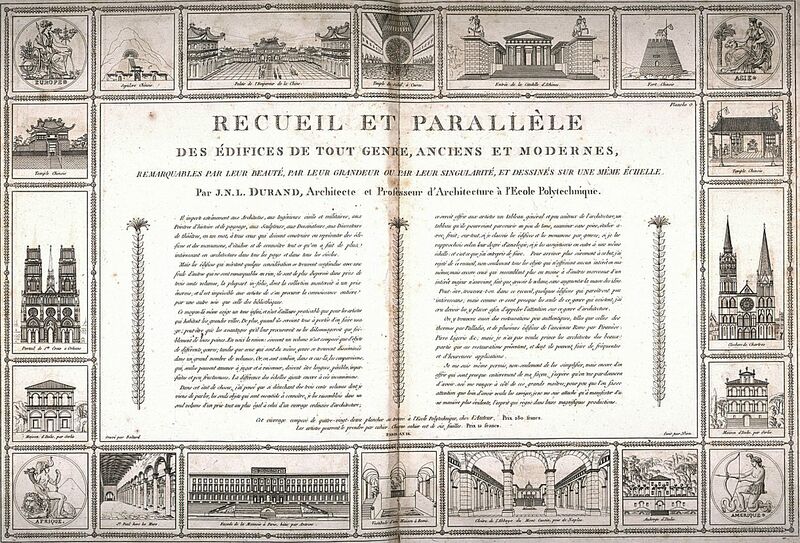 The Précis des leçons d'architecture données à l'Ecole Polytechnique published in two volumes 1802-5, and frequently republished until 1840, gave the content of the French architectural education. The Précis served as the basic text for the architects of the first half of the nineteenth century who had charge of the building programs in the states that arose after the collapse of Napoleon's Empire. Durand's eclecticism permitted the inclusion in his course of a variety of styles from medieval modes and Renaissance elements to classical revival forms. But as his basic tenet was "True beauty is born in pleasing disposition," he used the diverse elements in a functional, often revolutionary manner, quite differently from the Ecole des Beaux Arts where the doctrine of the antique triumphed. The striking plates that accompanied the text illustrate his ingenious manner of combining architectural elements in structural modular systems from colonnades to arches. The combinations classified "vertical" or "horizontal" become arrestingly impressive because of their repetition. All the various structures required by the nineteenth-century city are presented classified, as Cuvier had done for the field of zoology, according to their function: palaces, treasures, temples, law courts, town halls, colleges, libraries, museums, observatories, lighthouses, markets, exhibition halls, theaters, hospitals, baths, prisons, barracks, and houses. Durand's sense of economy and utility led him to replace, in the non-representational, service type building, the colonnade and dome with plain walls and simple arch openings. The Précis had been preceeded by the equally influential Recueil et parallèle des édifices en tout genre, anciens et modernes (1801). The Recueil, or "Le Grand Durand," was a product of the current interest in the philosophy of history and the lessons learned from the archaeological discoveries of the middle of the eighteenth century. The inclusion of well-known architectural examples from different cultures--Chinese, Indian, Egyptian, Assyrian--on the frontispiece was a striking example of the recognition of the universality of beauty that made all styles acceptable. With a confidence characteristic of the nineteenth century, Durand altered the proportions to conform to his own individual modular theory of proportion. Durand's influence was marked on the great German architects of the Romantic Classical style. Durand's insistence on a utilitarian, functional, and logical architecture contributed, through the American students in Paris, to the functional structures of the Chicago school. Elizabeth Gilmore Holt, From Classicists to the Impressionists: Art and Architecture in the 19th Century (1966), pp. 199-201. Szambien also deals with the "Grand Durand," the Recueil et parallèle. In this book of comparative history of architecture, the first of its kind, Durand "corrects" the architecture of the past, making it more rational and economic, so that the historical masterpieces, drawn to the same scale, can fit his typological classification. The Recueil was different in many ways from later 19th-century typological manuals. Szambien emphasizes that it was reprinted throughout the 19th century and also in the 20th century, in 1915 in America and in 1909, 1936, and 1981 in France. Its explicit impact was greater than that of the Précis, but it was obviously founded upon similar assumptions. Durand and Legrand set out to write the first "scientific" history of architecture, correcting the "mistakes" of Piranesi. There are, however, many false reconstructions. Alberto Pérez-Gómez, review of Werner Szambien, J.N.L. Durand 1760-1834 (Journal of the Society of Architectural Historians, December 1986). [I]t was in this spirit [i.e., the notion of a museum of architecture in book form,] that Boullee collected his exemplary designs and, before his death, wrote his commentary on them. Ledoux, similarly assembling his engraved works for publication, considered the result an "Encyclopedia or Architectural museum" in his 1800 description. Durand published in his remarkable successful Recueil et parallèle des édifices en tout genre, a "complete and inexpensive table of architecture," which artists and the students of the Ecole polytechnique "could look through quickly, examine without difficulty, and study fruitfully." As we have seen, Lequeu adopted this course in his isolation, preparing, in conjunction with lessons in rendering shadows, a collection of "a number of buildings of different peoples disseminated through the world." Durand was already well known as the compiler of the Recueil et parallèle des édifices en tout genre, anciens et modernes, Paris, 1800, a curious work in which the drawings of important buildings of all periods are freely modified to bring them into conformity with the author's modular theories of proportion. This is conveniently known as 'Le grand Durand'. Henry Russell Hitchcock, Architecture: Nineteenth and Twentieth Centuries (1996), p. 595. Stephen Lauf, seeking precedents... ...finding inspiration (Quondam: inaugural exhibition, 1997.03.20). In contrast to Quatremère de Quincy's encyclopedic concern the French architect J.N.L. Durand (1760-1834) developed in that same period a system of classification that addresses the production of architecture. As a teacher at the Ecole Polytechnique, the counterpart of the Ecole des Beaux-Arts, he wrote two complementary books, both intended as generative typology. In the first, the so-called Grand Durand, he presented an exhaustive typologically arranged overview of buildings influential at that time. Bernard Leupen, Design and Analysis (1997), p. 224. Durand's Recueil et parallèle des édifices, published in 1800, is a compendium of historical motifs, a true Musée imaginaire of world architecture. This is evident from the front cover, where the margins present illustrations of the major works of world architecture inserted between emblems representing the continents. The giant set of plates does not stand in contrast to Précis des leçons, since it is a further part of the new discourse on architecture that was emerging. In it the process of designing buildings and the history of architecture are kept strictly separate, as are teaching and the practice of design in Précis. Recueil was used for the teaching and design-practice of historical building until the late 20th century with great success. An index of the building tasks and motifs dealt with allows the reader to quickly skip to the appropriate synopsis. Everything is illustrated in precise copperplate engravings, all to the same scale, and limited to sharp outlines of the ground plan and/or an elevation: everything is treated, from aqueducts to Turkish buildings, from pump rooms to mosques, from all types of temples imaginable (which are distinguished typologically as either rectangular or circular) to theatres, from the ancient buildings in Palmyra to the innumerable decorations for capitals and ceilings. Durand marks the dawn of a new systematic approach to the history of architecture. On the one hand, buildings are arranged by individual plates according to their typological characteristics, for example "vaulted main buildings" or "monumental portico courtyards," so that the buildings' specific aspects, compared with similar architectural solutions, become readily apparent. On the other hand, there is a brief caption to every building and every reconstruction, stating its location and name, and sometimes the date of construction or the person responsible for the particular reconstruction, such as Villalpando in the case of the reconstruction of the Temple in Jerusalem. If these captions have the effect of picture titles, the layout of the plates goes a step further in the direction of a museum-like presentation. They appear as tableaux or exhibition walls that are frequently focused by means of prominent large illustrations of buildings on the central axis. To the side, smaller projects are presented symmetrically, forming a harmonious pattern with the regular ground plans and vertical elevations. The historical principle in the section on architectural motifs is of particular significance. The column capitals are not categorized in the traditional manner of Tuscan, Doric or Ionic, but according to historical succession of existing examples in Egypt, Greece and Rome. In this way, the tradition succession from Doric to Corinthian appears as a side effect, and the main methodological principle is provided by the topographical, historical headings. Christian Freigang, Architectural Theory from the Renaissance to the Present (Taschen, 2003), p. 330. Durand's approach was based on a misconception that man does not inhabit a qualitative place, but universal geometrical space. The objectivity of infinite Cartesian geometry was promoted over traditional, subjective notions as to what constituted inhabitable space. Expanding the rational mind took precedence over satisfying the sensual desires of the body. Durand's approach proved influential internationally. His Recueil et parallèle des édifices en tout genre (Paris, 1800/1) was the first scientific survey of the principal architectural monuments constructed since classical times (Egyptian and Roman) and included Italian and French examples up to the late eighteenth century. The buildings are arranged systematically, drawn to a common scale and grouped by building type. In so doing the buildings were isolated from any cultural and physical context, with building types--such as churches--arranged on the same sheet of paper for ease of comparison. With the emphasis on scientific method, Durand's idea was that the Recueil would make it possible to derive fixed architectural principles separately from historical style and urban context. This would encourage architects to arrive at rational planimetric solutions for different types of building form. It was of no interest to Durand that the differences in the forms of these buildings were a result of specific rituals or cultural traditions peculiar to a place, region or nation; or that the designs were responses to the constraints imposed by physical context, such as the proximity of adjacent buildings or street layouts. The examples he chose were represented as small-scale cartoons of buildings, simplified to elemental expressions (plans, sections and elevations) to provide universal design lessons for architects everywhere. Of course, the measuring scale that Durand used for this physical comparison was the metric system. Robert Tavernor, Smoot's Ear: The Measure of Humanity (2007), pp. 112-13.